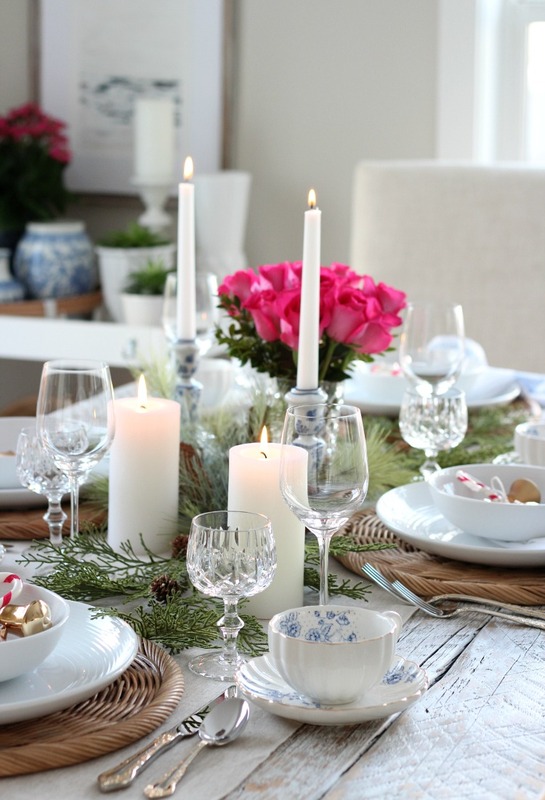 Ready to take a peek inside our home decorated for Christmas? 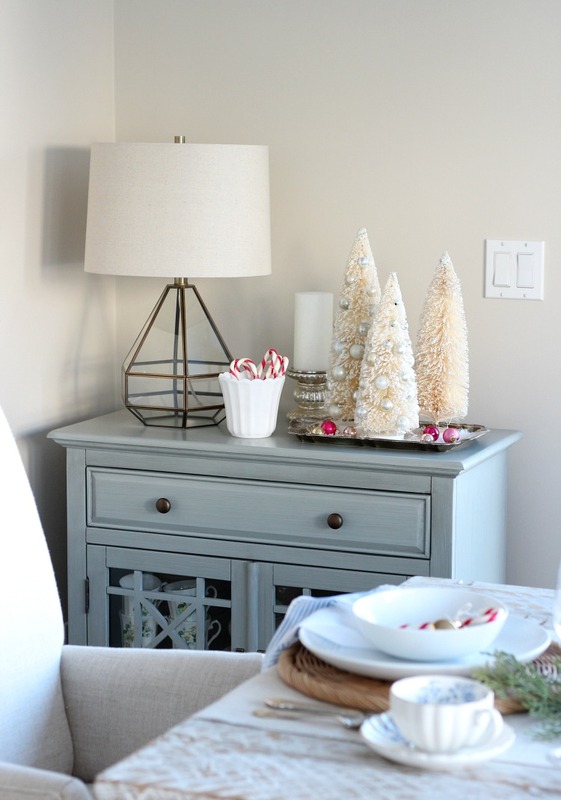 See how I used colour to create a pretty and festive look in our kitchen and dining room. Hello and welcome. It’s beginning to look a lot like Christmas! 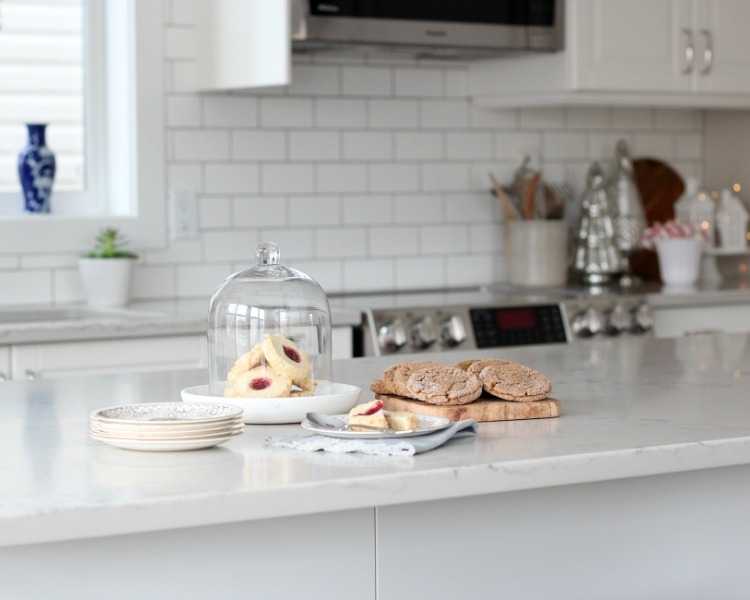 Today, I’m excited to be taking part in the annual Canadian Bloggers Christmas Home Tour hosted by my friends Christina of The DIY Mommy and Shannon from Home Made Lovely. You may recall last year’s Nature-inspired Christmas Tour and my White Christmas Tour from the previous year. Many of the same bloggers are playing along, as well as some new. Links to each are located at the bottom of this post, so please take a look as they unfold. 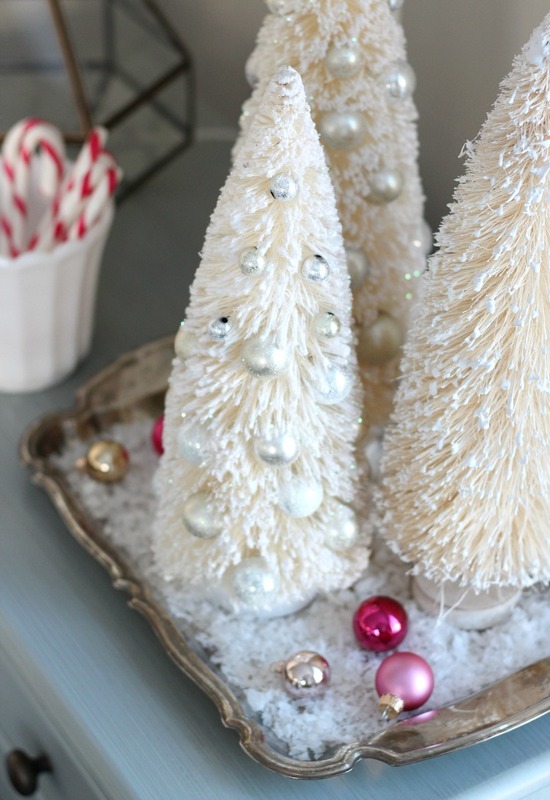 I’m certain you’ll leave with all kinds of holiday decorating ideas and inspiration! 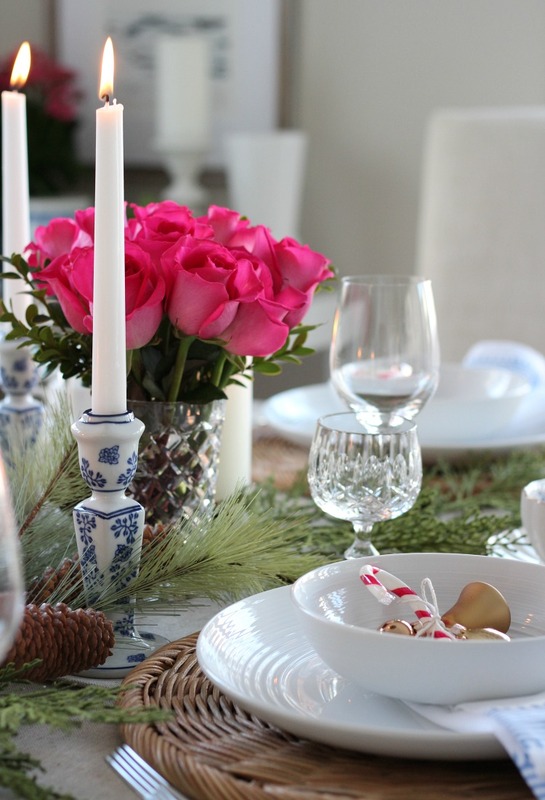 Earlier this week, I shared my Christmas Tablescape with pops of pink, blue and gold decor. Definitely a departure from my usual neutral holiday decorating scheme. For some reason or another, I was craving more colour. I think it may have to do with the shorter days this time of year and, perhaps, the feelings of needing to let go of perfectionism and too much structure in my life. Sometimes I think the older we get, the more serious we become (and it’s all in our minds). Thankfully I hadn’t moved anything around yet, so I was able to take a few more photos. Were they necessary? No. 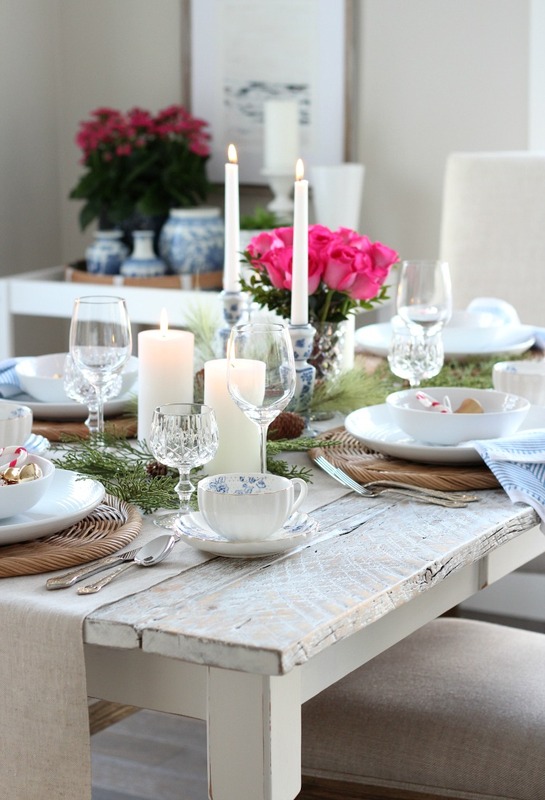 The table setting was just fine without them (again, you can see it HERE). 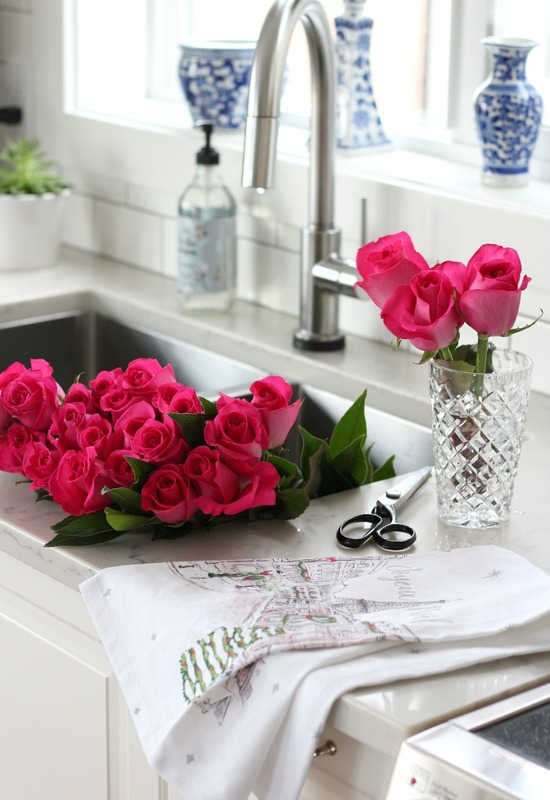 But fresh flowers bring a room to life. And, boy, do these ones smell amazing! They just happen to be the same colour as the new patterned rug I recently ordered for our kitchen. HELLO pink! I’m sure you’ve realized by now that it grew on me. In fact, my entire holiday decorating scheme was inspired by it! 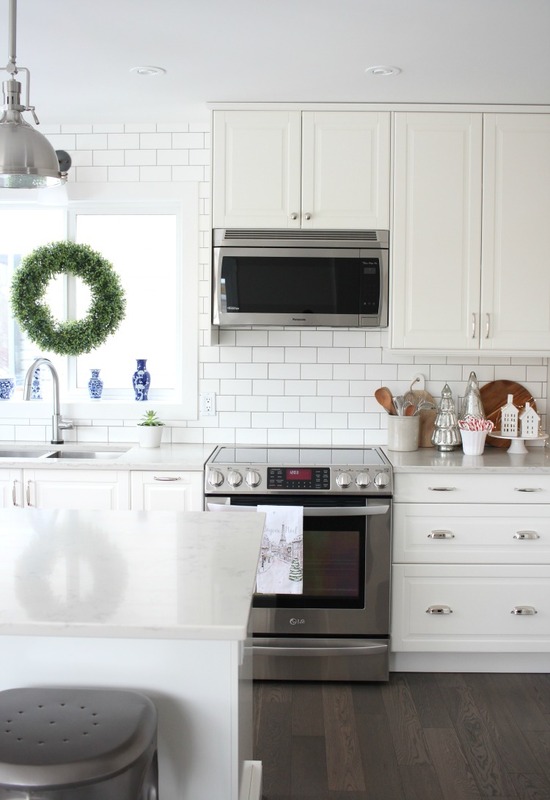 When we renovated our kitchen, I selected neutral finishes for that reason. It’s so easy to change the colour of our decor from season to season (if I want to). 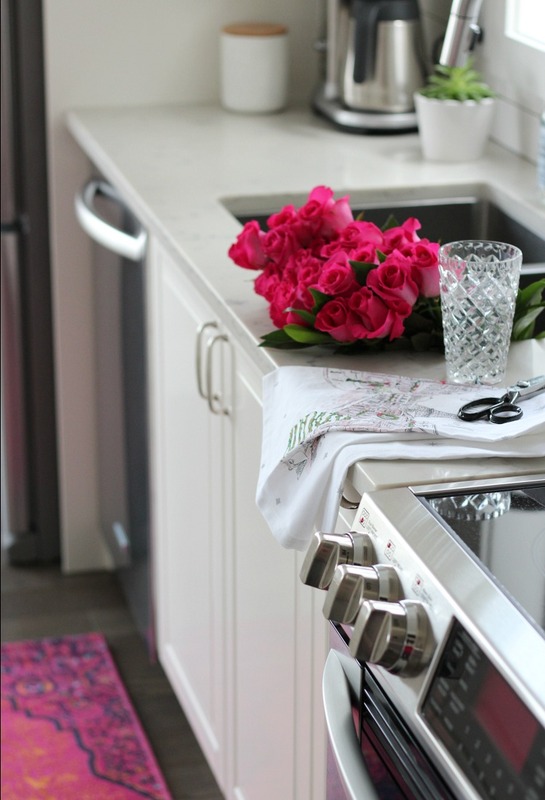 Adding touches of pink here and there was super easy and inexpensive. I decorated very minimally in our kitchen. You’ll likely recognize the boxwood wreath as it’s just so versatile that I move it around from space to space. 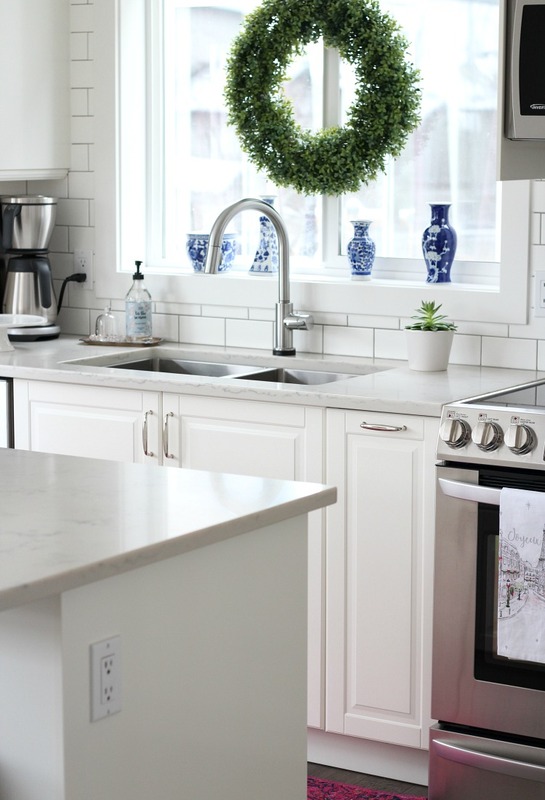 Having white cabinets and backsplash means everything pops against them, so I really don’t have to do much for high impact. 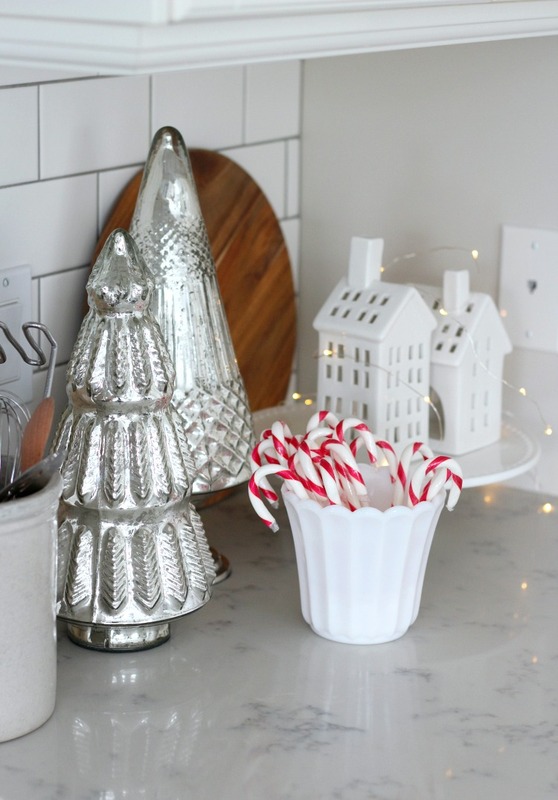 The mercury glass trees and white houses are new Christmas decorations (not from the thrift shop ha ha). I also added a few fairy lights that I had on hand for some fun. I always like to do a little baking during the holidays. 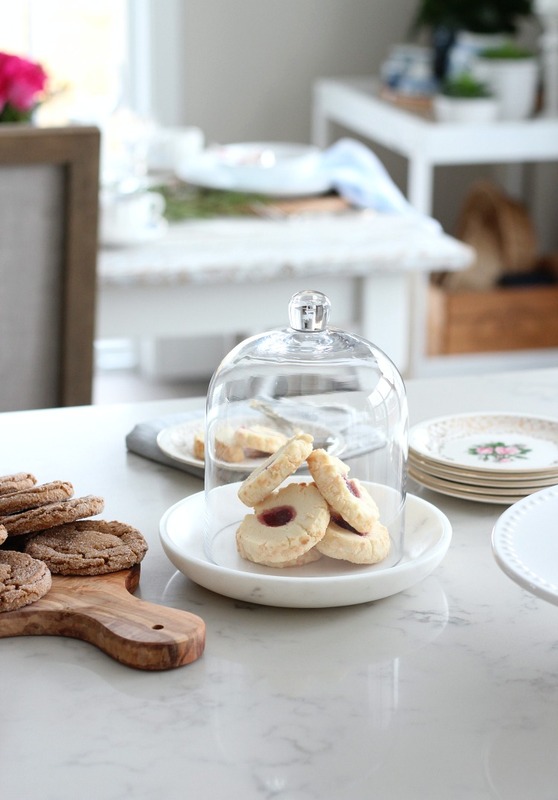 Two of my favourite cookies are chewy ginger and jam thumbprint. Have you made anything yet? Our son will be home from university soon and will definitely be looking through the freezer! Sometimes, I do leave a few on the counter displayed in a cloche or pretty glass container. Unfortunately, I find them hard to resist! Well, that’s it for today. I’m hoping to share our Christmas Tree and other parts of our home soon (time permitting). Be sure to follow along on Instagram so you don’t miss a thing, and I’d love for you to SUBSCRIBE. And, finally, here’s a sneak peek of our living room with more pink! More Homes Decorated for the Holidays! 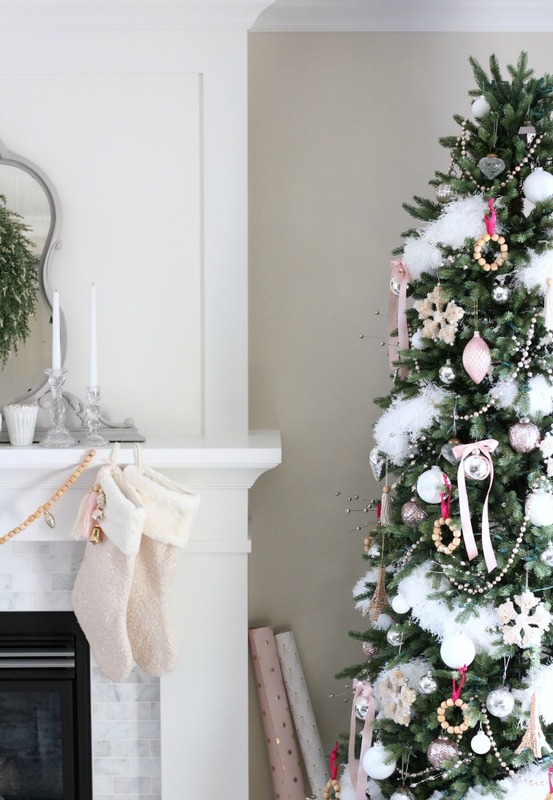 Now it’s time to take a peek inside all of the other beautiful homes in the Canadian Bloggers Christmas Home Tour. Grab a cup of hot cocoa and enjoy! I know you didn’t do it just for me, but those pops of pink absolutely made my day! they look lovely against the blue, white, and green. 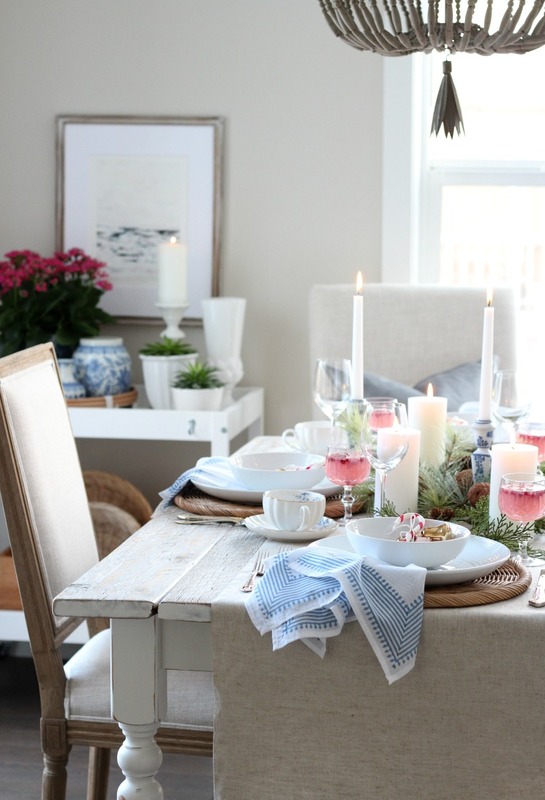 Everything looks so warm and cozy, and those pops of pink woven throughout are so fun! Just beautiful Shauna! I LOVE your new rug and can totally see why you used it as inspiration for your Christmas decorating…it’s perfect! Merry Christmas! Shauna, your home is so beautiful! 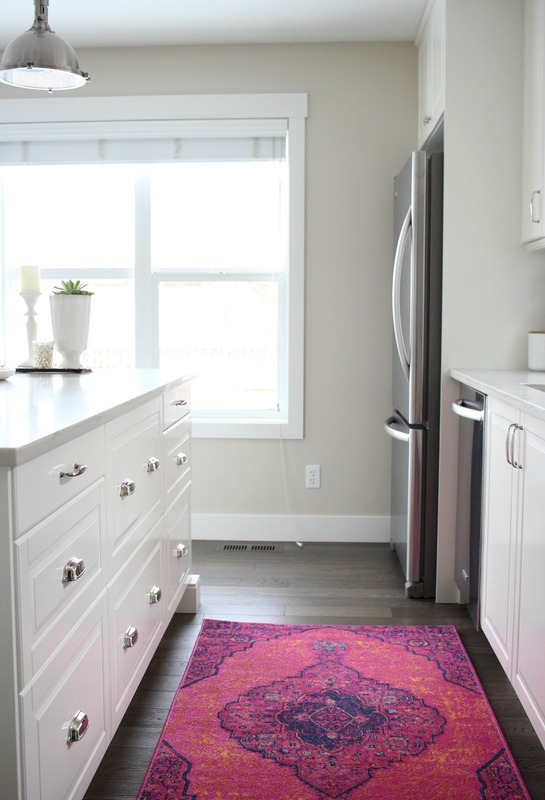 I love seeing the pops of pink and your rug is gorgeous. Such a lovely tour- you did a beautiful job decorating this season. We made cookies twice last week! 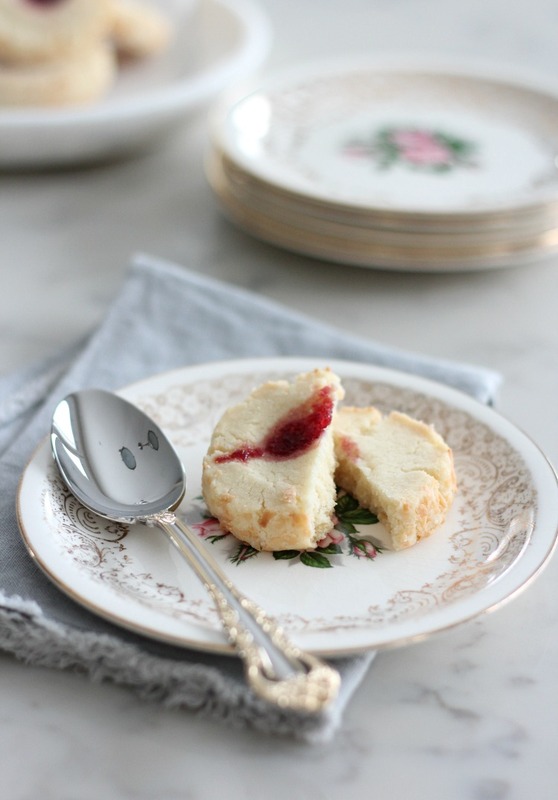 Once at home with my kids, and then an impromptu baking day with my bestie and our 8 kids… always fun! Merry Christmas!